500 of the World's Greatest Traps! Five classic Traps books collected in one volume giving you over 500 engines of destruction, delver dicers and player character crushers. Now remastered and with new art by original Traps artist Steven S Crompton. This collection also includes an entirely new section of never-before-seen traps from Grimtooth's archives, along with behind the scenes articles on the origins of Grimtooth and the Traps phenomenon. Plus rare art, Grimtooth comics, Trap puzzles and more! 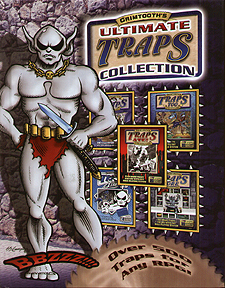 It Truly is THE Ultimate TRAPS Collection!